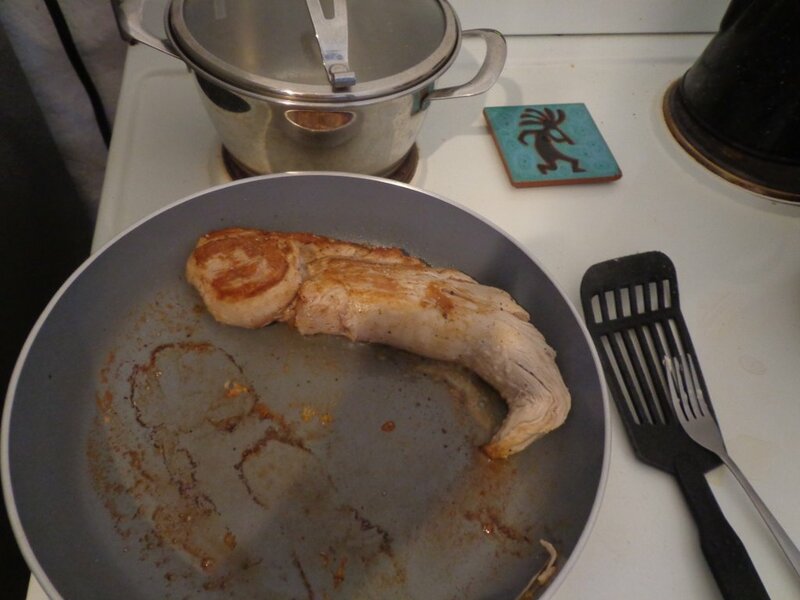 Pork Wellington is a dish created by a certain gourmand and which I especially appreciate for its competent obfuscation of that off-copper, sub-glottal twinge that typically assaults one attempting to finish their liver1. It's pretty much a roast-in-crust, with the more common beef tenderloin swapped out for pork, and the pate made with chicken rather than goose liver, which is also deeply spiced. Make the pastry first so it can sit in the fridge while everything else gets going. 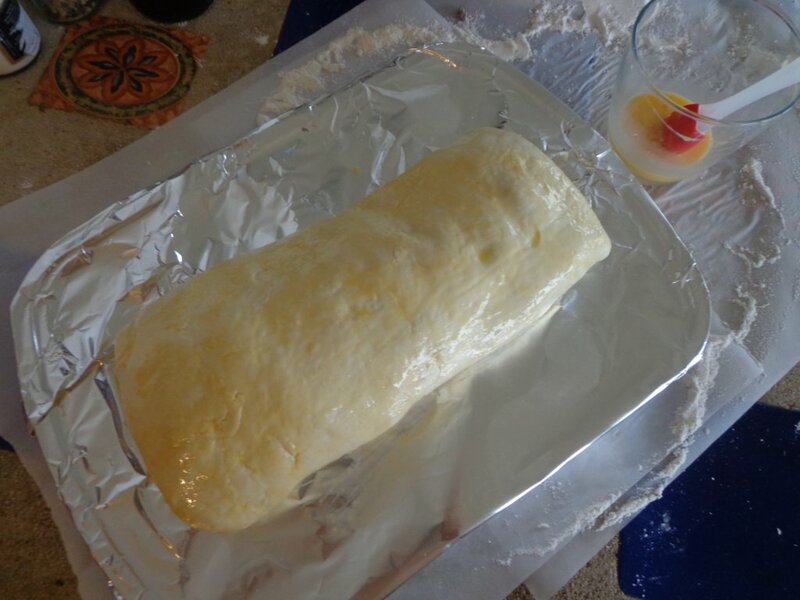 Follow a basic pate brisee method, but sift in some baking powder before you cut in the butter. Smoosh it into a disk and let it chill so it's easier to roll later. Next make the pate. Dump about a kilo of fresh chicken liver into a big pot of boiling water and get ready to lose some of your enthusiasm about eating this thing later on (don't worry, it'll come back). Sorting through your livers to discard any gallbladders that might've gotten in there before this point is a good idea. 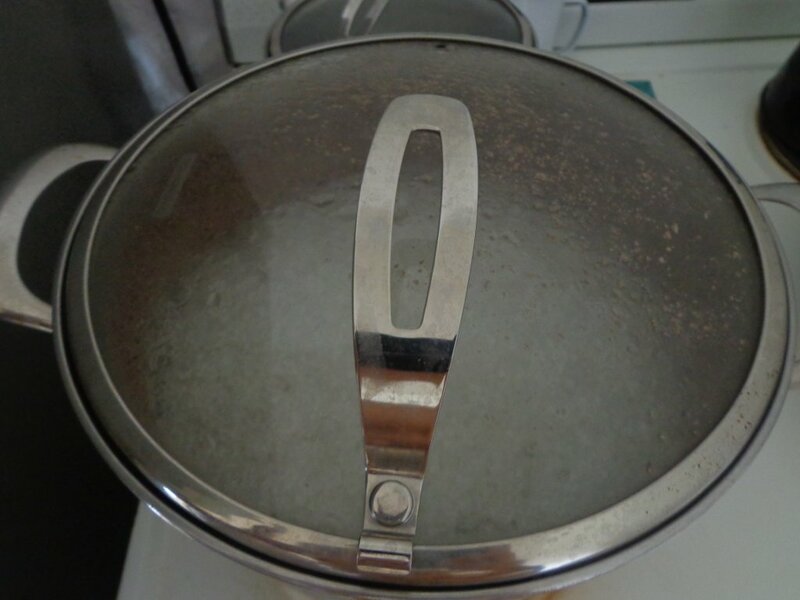 A few drops of whatever vinegar you have on hand will help tame the smell and aid coagulation in the pot. Keep it roiling for half an hour, then drain the stuff and dump it into a bowl with your spice mixture, which should contain around ten grams of allspice berries with black and white peppercorns to taste, finely ground. Mash these up with a fork, adding a pat of butter now and then to achieve a thick, clumpy velvet sort of texture. Remove any whitish membrane threads you find during this procedure. Once you're happy with the texture, add a few spoonfulls of fermented dairy --I used plain yogurt and some splashes of kefir, though sour cream would also work. 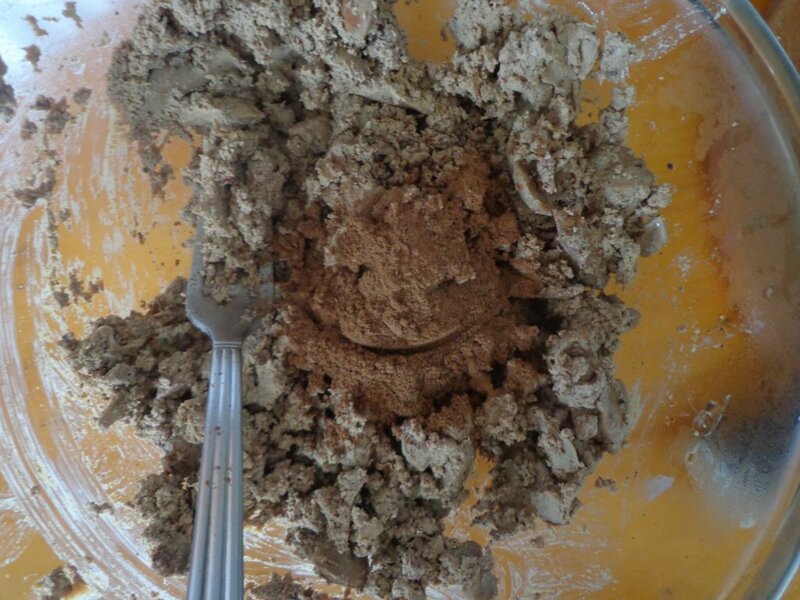 This'll make the pate easily spreadable, a paste rather than a stucco. Now it's time to sear your steak; heat a pan to suparhot with some butter, and brown the tenderloin on all sides, giving the whole thing no more than two minutes or so, then transfer it to a plate to cut the heat. 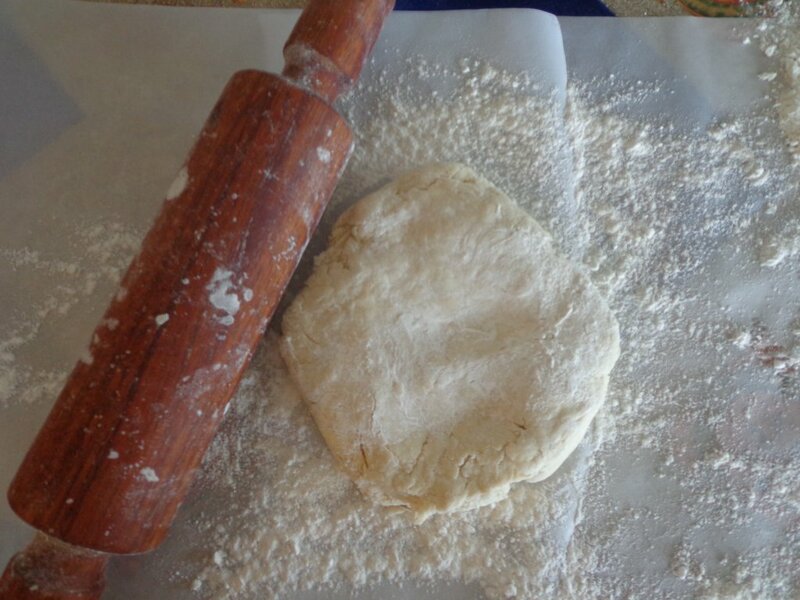 Your components now prepared, you can proceed to roll out the dough; try to make a shape that more or less echoes that of the tenderloin. 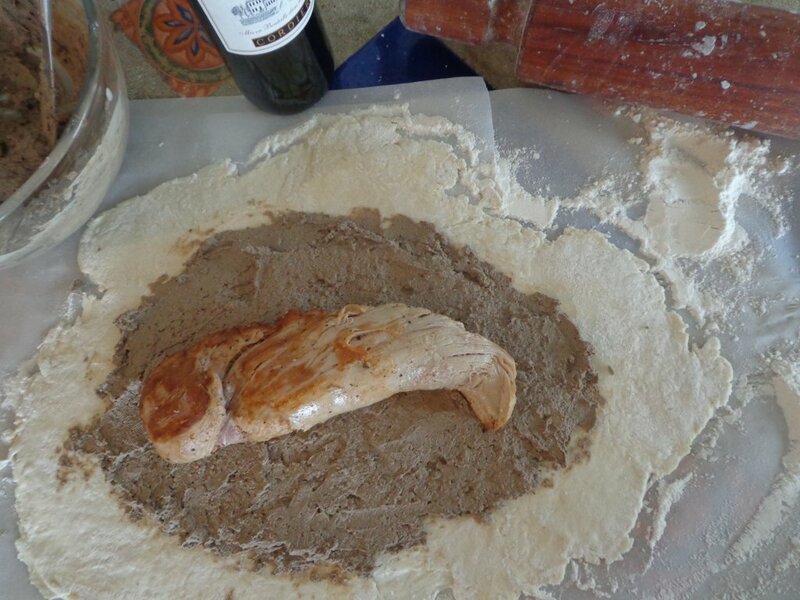 Spread about half of the pate on the dough, leaving a goodly margin as below, then plop the seared tenderloin on top. Slather on the rest of the pate2. At this point you'd typically spangle the log3 with sliced mushrooms, but I opted to make a bechamel of dried porcinis instead. A sprinkling of fresh thyme leaves works well, too. Anyway, wrap the thing up like any other package, taking care not to get much of any overlap of the dough, else it'll end up too thick in places. Seal on top or along the sides, brush with an eggwash, slash a few holes, and stick it in the oven around 190C for about 50 minutes. Pork Wellington is best eaten with his dearest friends in tow: Sir Worchestershire, Herr Rottkohl, and Madamme Bordeaux.